Wednesday 17th September 2014. London: EE, the UK’s most advanced digital communications company, today launched a refreshed range of 4G SIM Only plans, designed to simplify the variety of options to best suit customers’ needs. Available immediately in EE shops, as well as via the EE online shop and EE telesales, the new 12 Month and 30 Day plans offer an increasingly flexible way for customers to access the biggest and fastest 4G network in the UK. The new plans start from just £9.99 per month, and for customers who take out an EE Extra plan from £15.99, receive unlimited UK calls and texts, double speed 4G and free calls to 080 numbers. 4GEE now covers 75% of the population, 263 major towns and cities and over 2,500 villages and small towns, making EE’s 4G network the biggest in the UK. EE was also recently ranked number one mobile network in the UK following comprehensive independent testing from RootMetrics®. 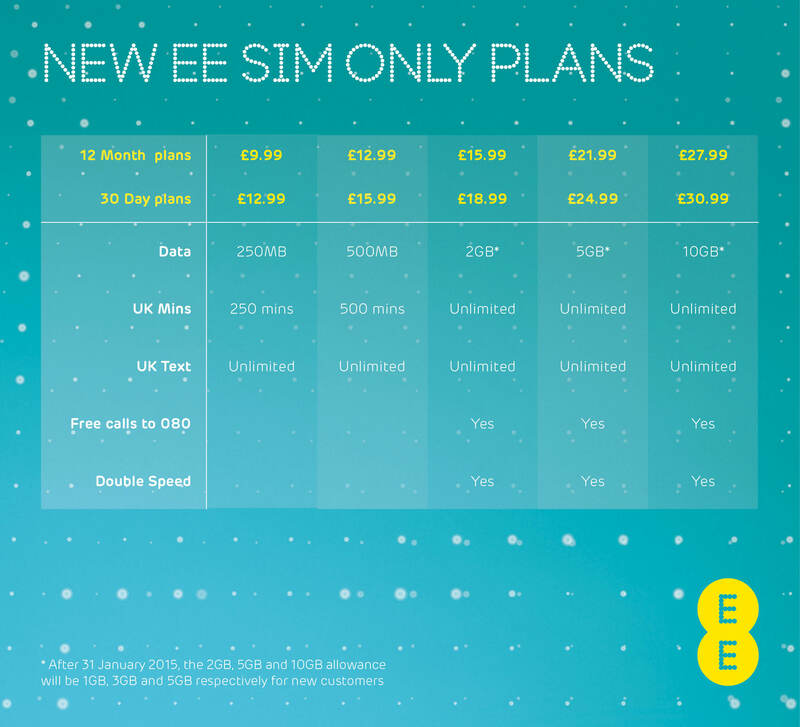 For further information and full details of EE’s new price plans, please visit www.ee.co.uk. * After 31 January 2015, the 2GB, 5GB and 10GB allowances will be 1GB, 3GB and 5GB respectively for new customers.